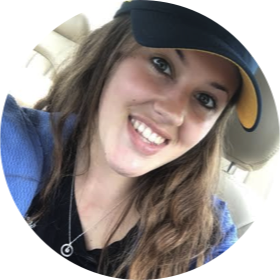 Read Kelsi's review of Trouble. 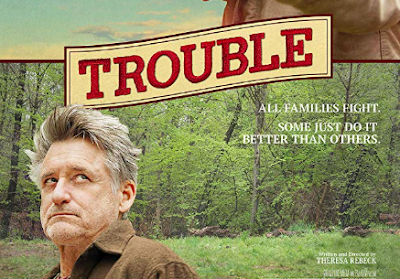 Trouble is a rollicking comedy about two siblings who stop at nothing to outwit one another in a battle for control of family real estate. The fact that in this case, the dueling brother and sister are getting on in years, but are still locked in a rivalry that most adults have long outgrown, makes their story a fresh and funny high-stakes conflict. 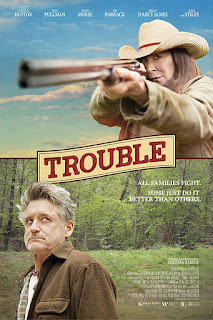 Academy Award-winner Anjelica Huston stars as Maggie, a tough-as-nails widow who fights to hold onto the family’s beautiful wooded homestead in rural Vermont, while Bill Pullman, playing her ne’er-do-well brother, Ben, plots to sell the land to developers right out from under her. Preferring to fight rather than settle their differences in a mature fashion, the siblings wage war with forged documents, bribes, collusion, and, when push comes to shove, a rifle, in a fight to (just about…well, close to) the death. Trouble is in select theaters on November 2nd, 2018. Trouble is all about family feuds. We all know siblings can get into fights sometimes, but the fight between these two never seems to stop. Older sister Maggie (Anjelica Huston) and little brother Ben (Bill Pullman) constantly go at it, until one of them gets seriously injured. Ben and Maggie seemed to be close as kids, but when Maggie had to leave for college their bond quickly broke in two. Ben, who struggled in school and never made it far, was left alone with his dad after Maggie moved out and never came back. We watch as the two sibling’s flashback to when they were younger and reminisce about the times they used to have together. Now a day though, the land their father had left them in his will, with good intentions, has become their battle ground. While this movie has its laughs, it has its seriousness as well. It makes you realize that holding a grudge never did anyone any good; all can and should be forgiven. Not just for the other person, but for our own wellbeing too. I thought the actors played their roles well and made the film enjoyable. However, I wouldn’t say this is a favorite!